"Have you ever noticed how people who follow their dreams have a certain glow? Energy, confidence, and focus seem to permeate their beings." I'm amazed at the number of emails I get from people in business who miss this f.r.e.e. way to promote themselves. Use a proper signature line in all your emails! You can set this up to happen automatically in your email program. What should it contain? Your name, title, business name and all your contact information including a link to see samples of your work on your website (or your page in the Staging Diva Directory). A good signature will include a short promo message. You never know who will forward your email to someone else and what business that can lead to. Busy people won't search for your information. Make it easy for everyone who reads your email to call you or go visit your portfolio on line. You'll find a link to a tutorial on how set up an automatic signature in your own email program in my post on The Staging Diva Network. 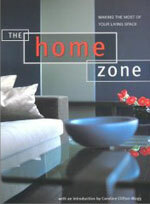 I review and recommend this book in the June 2006 issue of Style at Home Magazine. I chose it for the inspiring room photos and the discussion of 5 popular decorating styles. While beautiful, these homes still look lived in! Over 20 graduates have joined since the January launch and traffic continues to build. If you only got one project in a whole year, it would STILL pay for itself! How can you lose? And you have so much to gain! While I can't answer the thousands of individual requests I get for business advice, I do answer questions within this forum because my replies benefit the whole Staging Diva Network community. You'll also learn lots and feel inspired by the discussions with your fellow Staging Diva Graduates. You are receiving this newsletter because you expressed interest in learning about the business of Home Staging. If you don't want to continue, use the "Unsubscribe" link at the very bottom of this email. The pace of house sales has slowed in most major markets in both Canada and the US. This is one of the reasons I've had so much media coverage this spring. The article at right appeared in the May issue of Center of the City Magazine. What does a slower real estate market mean to you in promoting your home staging business? There are many advantages to being in the home staging business and one of them is that home staging works in both buyer's and seller's markets. As the real estate market slows down, it shifts from being a seller's market to a buyer's market. In a buyer's market, there are more listings and fewer buyers. As you can imagine, such an environment is perfect for marketing the benefits of staging to homeowners and agents alike (each with their own target-specific marketing message of course). Staging is an important tool in coping with a slowing real estate market and you need to use this to your advantage to build your business. CNN Money interviewed me on this very topic. Given the time of year, if you're already in your staging business, expect to get busy very soon. We're at the tail end of the spring market and if you've done the right marketing, you'll hear from desperate homeowners and their agents who have been unsuccessful in selling. There's nothing like being faced with the prospect of owning two homes, or having your whole life on hold waiting for a sale, to motivate someone to invest in our services! If you're a graduate of the Staging Diva Program, review your notes from courses 1, 3 and 4 on how to promote home staging in a slowing market. If you haven't taken these Staging Diva courses, you can order recordings now for only $179 each or join the next live course series with me and take all 5 courses for $795 (a $100 s.a.v.i.n.g). Congratulations to recent graduate Dana Lukken who staged her own home and sold it for a $100,000 profit after owning it only 8 months. What a great success story to market her new staging business! Look forward to seeing the before and after shots! Congratulations to new graduate Denise Cerro on the launch of Cerro Staging & Redesign (CA). 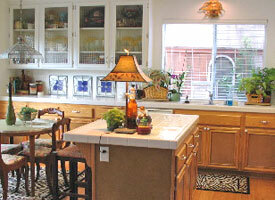 Check out this awesome kitchen makeover from her listing in the Staging Diva Directory! Congratulations to Leah Fritz, Perfect Place Home Staging (WI) invited to make a home staging presentation to the biggest real estate company in her area. A realtor/builder from another office offers Leah's services as part of her new listing package. Leah writes "I've been getting really positive feedback on my page in the Staging Diva Directory. Thanks for helping me put it together, I now see how important it is for marketing." Congratulations to Marcia Lenci, Ambient Designs (CA) who wrote "After listening to the 5 recordings of the Staging Diva Training Program, I built a website and sent the link to a realtor, who in turn forwarded it to all 100 people in her office. Within 4 days I got my first job, a $1.3 million home. If I had not read/heard your material on marketing myself and being mindful of what my services are worth, I might have undercharged the client. They were thrilled with the results and never knew it was my first project." Congratulations to Lisa Allen, Staged Rewards (ON) who took what she learned in Staging Diva Sales & Market Secrets and landed an "Ask the Expert" column in her local newspaper. I used these marketing methods to grow my own staging company, Six Elements, to a considerable size in under 2 years, never placing an ad or even printing a brochure! 1. Wall color effects how everything else in the room looks. Before finalizing your recommendations, always put any color swatch you are considering up against the floor, trim, furniture and art. 2. When you've selected your palette, spread out just those color chips together to ensure they all work together. That way, when one room is visible from another, the juxtaposition of each color will be pleasing. 3. Unfinished concrete floors can be painted and dramatically improve the look of an unfinished basement, laundry or furnace room. Don't paint the concrete gray (as most people mistakenly do), then it still looks like concrete! These are only 3 of the 30 Tips to Choosing Color for Home Staging Projects that you'll find in the new "Staging Diva™ Ultimate Color Guide: the easy way to pick colors for home staging projects". 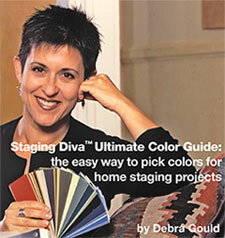 "The Staging Diva Ultimate Color Guide is immensely valuable! It saved me hundreds of hours. Within 45 minutes, I had my own Staging Fan Deck put together. It's easier to carry, less daunting for clients and reinforces my professionalism and expertise. Debra, your suggestions are brilliant. I cannot tell you how inspiring you are!" You can order "Staging Diva™ Ultimate Color Guide: the easy way to pick colors for home staging projects" and have it emailed to you within 24 hours. This CityTV News at 6 feature highlighted one of my staging projects and gave solid evidence of the significant returns a homeowner can earn hiring a home stager. I was only able to stage one of the 5 new projects that came my way because of the story. Others were referred to Staging Diva Graduates. 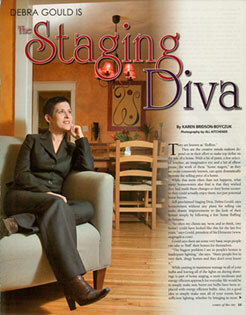 The Staging Diva Training Program will be featured in Entrepreneur's StartUps Magazine, Summer 2006. The Official Pre-Mover Savings Guide features my tips for preparing a house to sell. Written to entice readers into learning more about what a Professional Home Stager can do and distributed by Coldwell Banker and Century 21 agents throughout the US. An excellent lead generator for Staging Diva Graduates! The magazine will be repeating the story in future issues. With every media appearance, I get calls from people looking for a home stager in their market. During the first week of May, I referred 10 projects to Staging Diva Graduates. I also turned down 8 projects because I had no one to refer them to! 98% of the time, the Graduates who actually get work from my referrals have a page on the Staging Diva Directory and/or their own website. It's rare for someone to hire a stager when they can't see samples of their work. What projects are you missing out on? What is that costing you?